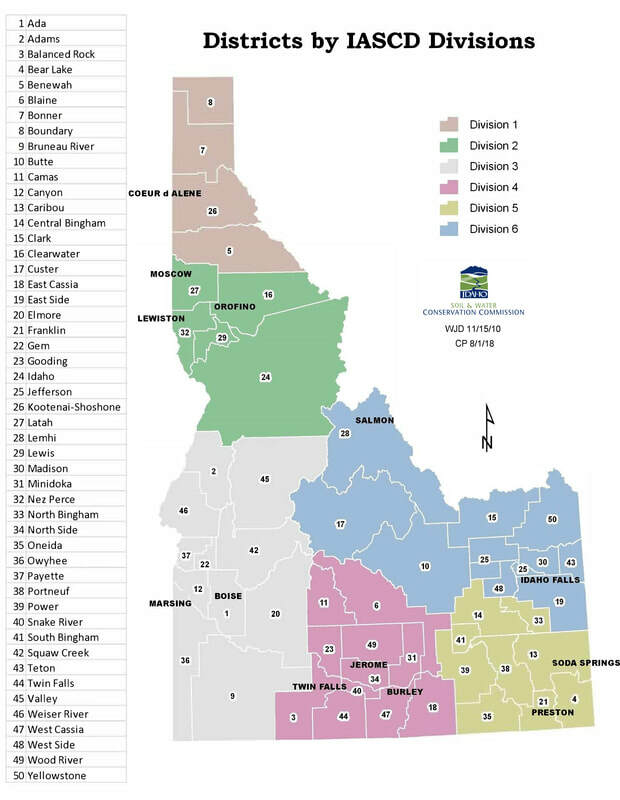 Idaho District Employee Association (IDEA) was established in 1987 to represent the interests of Idaho's District Employee's at a state and national level. IDEA is a voluntary association of employees employed by Idaho's 50 Soil Conservation Districts, and is closely affiliated with the Idaho Association of Soil Conservation Districts (IASCD) and the National Association of Conservation Districts (NACD). IDEA promotes and supports the professional development of District employees. The IDEA President also serves as an advisor to the Idaho Soil and Water Conservation Commission. Members of IDEA also serve as advisors to five IASCD standing committees. IDEA is managed by a seven member board of Directors, six of whom are elected by the Districts in each of the six Divisions. An additional Director at Large is chosen from the same Division as the President of IDEA to serve on the board of Directors. Officers include the President, Vice President, Secretary, Treasurer and Historian. IDEA activities are supported by district employee membership dues that are sponsored by District Conservation boards, fundraisers and a percentage of Idaho Association of Soil Conservation District (IASCD) profit from the IASCD annual conference. IDEA is assisted by advisors representing the Idaho Soil and Water Conservation Commission, Idaho Association of Conservation Districts and the Natural Resource Conservation Service and operates according to its own bylaws. Known in various parts of the country as “soil and water conservation districts,” “resource conservation districts,” “natural resource districts,” “land conservation committees” and similar names, they share a single mission: to coordinate assistance from all available sources—public and private, local, state and federal—in an effort to develop locally-driven solutions to natural resource concerns.